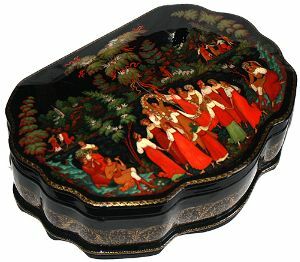 This box was displayed on an Expo in All-Russia Museum of Folk and Applied Art in Moscow (May-September 2010). This gorgeous large box was created by the talented Olga Kolygina from the village of Palekh. It shows how the Russians celebrate the ancient Russian festival called "Semik". It is celebrated in the middle of June (the seventh Thursday after Easter). This festival is notable for a complex of rites such as marking farewell to spring and welcoming summer. Celebration of this festival includes glorification of verdant Earth; the central figure of this festival is birch. Celebrating this festival people decorate their houses with birch twigs and flowers. Young people sing and dance in a ring round a birch, play different games and decorate birches with multi-colored ribbons. The composition painted in the traditional Palekh style is very bright and colorful. The costumes of the characters, and the surrounding landscape are richly detailed with gold and aluminum paint. The piece is constructed from paper-mache. Black lacquer is used to paint its exterior while red lacquer completes its interior. The exterior is richly decorated with intricate gold ornaments. The lid is hinged from the top of the scene and the box rests on legs. The work is signed with the artist's name, the title ("Summer Festival") , the village of Palekh and the year of 2009.